The following is an excerpt from a newly announced book about Mass Effect. It's impossible to examine Mass Effect 1 in any kind of complete fashion without grappling with this question. In fact, there are times when I think that it might be the question that most needs answering about first Mass Effect. After all, this is a tremendously ambitious game. It's a game that creates a huge, diverse universe, then populates that universe with different races, societies, and histories. It's a game famous for allowing you to create and define your character through moral choice, above and beyond almost anything that had come before. Story, gameplay, genre, all of these game components had some level of striving or freshness to them. And then you spend a huge chunk of the game driving a crappy little buggy around nearly-deserted planets. What purpose does that serve? In the game world itself, the Mako is used in two distinct manners: linear, mandatory plot missions; and optional explorations and side quests. If you're playing through Mass Effect without doing any side quests, you may only see the Mako in plot missions. In those, you'll fight some Geth units, but Mako combat is not particularly interesting. You either drive directly over smaller units, or you engage in a slow back-and-forth with the larger Geth, dodging their attacks while you wait for your cannon to recharge. Mako combat can be occasionally entertaining and challenging, and it provides variety when compared to the normal combat, but it's certainly not great enough to justify the Mako's existence on its own. What the Mako plot missions do provide is a sense of speed that the game doesn't otherwise accomplish. For example, you're sent to Feros knowing only that Saren and his Geth are searching for something there. Your initial interactions in the colony reinforce and complicate that mystery. You switch to the Mako at the point when Commander Shepard and crew switch into a more active role in trying to solve the mystery. Speeding across the crumbling bridges of the planet in the Mako as Geth move to attack immediately, straightforwardly, ratchets up that section's intensity. From that point, the mystery moves toward resolution, and driving the Mako reinforces the feeling that the story is gaining momentum. Driving the Mako also illustrates the sheer size of the game space, on both plot-necessary and optional planets. After all, space is big! The main point of the Mako, what gives it reason to exist, is that it illustrates the size of Mass Effect's setting. For Mass Effect to work as a science fiction epic with galactic scope, it has to feel huge. Flying the Normandy from system to system is abstracted to the point of irrelevance, while the on-foot sections of the game are small and limited, particularly when compared to open-world games like the Elder Scrolls or Grand Theft Auto series. So it's the responsibility of that crappy little buggy to illustrate the size of the universe—the size of the possibility space in Mass Effect. If you want to see huge moons rising above mountain peaks on alien worlds, you can only see that in the Mako. If you want to see an apparent wasteland actually populated by the Thresher Maw, the most alien of the aliens in Mass Effect,, and have any chance of surviving, you'll need to use the Mako. It goes beyond geographic size as well. Many of Mass Effect's side quests take place on the desolate worlds you explore with the Mako, like the long chain that introduces the Cerberus organization—the Mako ends up expanding Mass Effect's story space as well as its literal space. This setting expansion was largely missing from the later games in the series. Mass Effect 1 may have been less polished than its successors in important ways, but it also offered something that the sequels didn't: the feeling that the universe is huge and ready to be explored. Mass Effect 2's equivalent to Mako exploration, planetary scanning, offered no moments of beauty or skill. Meanwhile, its vehicle, the Hammerhead, was only available as an optional purchased add-on, and only used in-game for linear, specific missions. Mass Effect 3 went in entirely different directions for its general exploration. Being able to hop into the buggy and drive around dozens of different planets without direct purpose was a huge part of how the first Mass Effect managed to convey a sense of scope and wonder that the later games didn't want to—and didn't need to, since the first had been so effective. What's most impressive, then, is that the Mako accomplishes all this while not actually being terribly entertaining to use. “Clunky” would be the most appropriate word, but the effects of that clunkiness are diluted by how forgiving the Mako is. You can briefly float and jump with it, and it will self-correct so that you'll usually land facing up and ready to drive more. It can crawl up all but the steepest grades of mountain, even if that does take forever. There are even small joys to be found when driving the Mako, like picking the best path to get around an obstacle, or launching yourself off a ridge and using the thrusters to manage a bouncing landing. Yes, it's clunky, but not disastrously so. There's another form of space that the Mako provides: space to pause, or space to think. Driving across a surface with nothing but rocks, looking for a map marker that may be essentially nothing, these seem like they should be boring tasks. But they're also moments for you to recharge so that you can pay attention to the dramatic moments to come. Although it must be said that the non-linear exploration choice in Mass Effect 1 makes it all too easy to drive the Mako too much without engaging in other aspects of the game, and overload. This happened to me the first time I played thanks to my completionist tendencies combined with not knowing the pacing of the story missions, and I know I'm not alone. 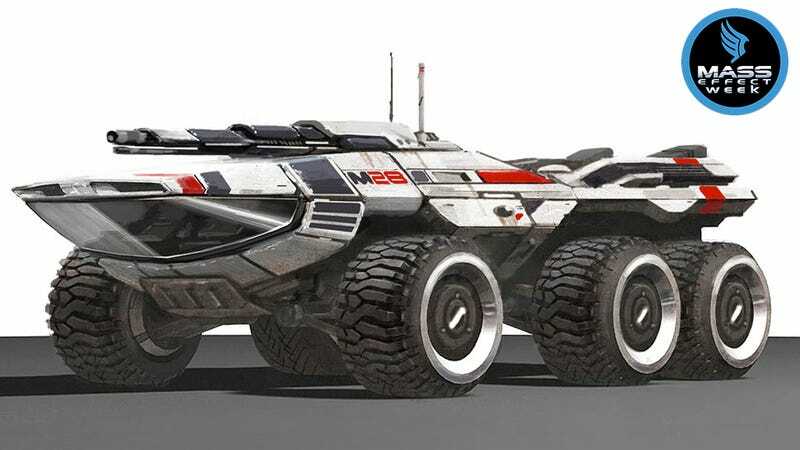 The Mako serves as a metaphor for the entire Mass Effect series. Like so many other aspects of the games, it's easy to spot the flaws and annoyances and clunkiness. Yet despite being a mess on its own, when it's taken in context with every other flawed component of the games, the Mako works. It works because the Mass Effect games are so ambitious and try to do so many different things. That encourages us, as players, to want to see the best in them. The Mako may not be great from a game design perspective, but it helps demonstrate the greatness of the game it's a part of. Possibility Space will be a book-length analysis of the Mass Effect games, written by video game and pop culture critic Rowan Kaiser. It will be structured as a series of chronological essays about many of the various components of the Mass Effect games, and released as a full ebook. Please check its GoFundMe page for more information and support possibilities. Rowan Kaiser is a freelance pop culture critic currently living in the Bay Area. He is a contributing writer at The A.V. Club, covering television and literature. He also writes about video games for several different publications,including Joystiq as a role-playing game columnist, in addition to The American Prospect, Bit Creature, Gameranx, and Gamespy (RIP). Follow him on Twitter @rowankaiser for unimportant musings on media and extremely important kitten photographs.